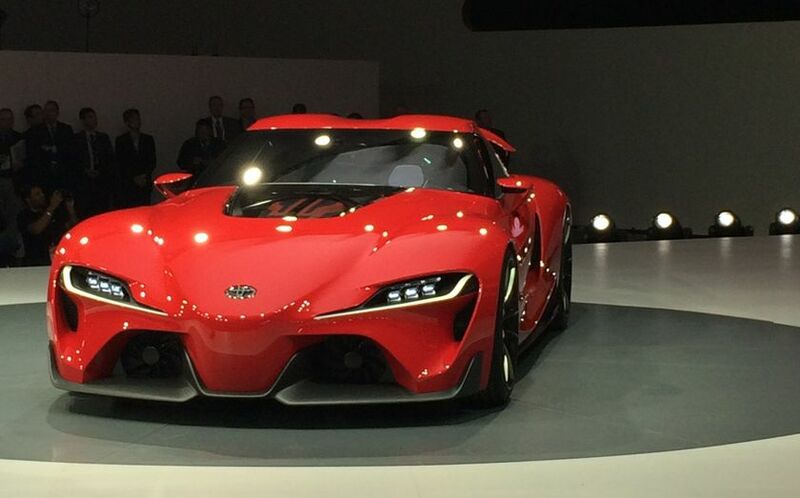 DETROIT, Michigan (Jan. 13, 2014) - Toyota virtually blew the doors off the North American International Auto Show with the reveal of the stunning FT-1 sports car concept. First devised by Calty Design Research in the Sony PlayStation Gran Turismo game environment, FT-1 leapt from the screen to the stage in a race-inspired press conference at COBO Hall. The interior is a focused, highly functional “place of business” that locates the driver at the controls behind an F1 inspired steering-wheel. The intimate, low slung cockpit has its A-pillars set far back to help optimize cornering vision and sensation of the cabin’s intimacy. A delta-shaped display zone surrounds and integrates the driver to provide an exhilarating sense of being connected to the vehicle. The cockpit’s sense of minimalism adds to the purposefulness of the driver-focused environment with an emphasis on light weight components such as the composite seat covered with just the right amount of padding in only the areas that come into contact with the driver. A colour heads-up display keeps the driver’s attention on the road ahead, with vital information projected just above the steering wheel within the driver’s line of sight. In preparation for pitching the concept to Toyota management, Calty worked with Polyphony Digital, creators of the popular Gran Turismo driving simulator, to bring FT-1 to life in a virtual world that captured the excitement, passion and performance conveyed by the concept model. Toyota executives were offered the opportunity to take FT-1 for a timed lap around a computer-generated Fuji Speedway. Behind the wheel of the concept, Toyota president Akio Toyoda, an accomplished race car driver, completed the virtual circuit faster than his best real-world lap time at Fuji in his LFA. From that moment, he was convinced and the concept was approved to be built in model-form for the international auto show circuit.